The Gear 2 Neo is a strong move forward for Samsung - the smartwatch category still needs work to be truly needed, but if you've got a Samsung device, this is a great companion. The Gear 2 Neo is an odd device - not because it's a smartwatch, and not because it arrives less than six months after its predecessor, but because it's a slimmed down version of the main Gear device. I'd have imagined Samsung would launch the Gear 2 Neo separately after the fanfare of the main Gear 2 - clad as it was in metal, complete with camera - had died down so it didn't steal the limelight. As it was, the two launched together (along with the impressive Gear Fit) and it was the Gear 2 Neo, not the main version that piqued my interest. I liked the theory behind the Galaxy Gear. Smartwatches are cool to the technology lover, if impractical, and the Gear began to scratch that itch. I liked notifications on my wrist, but not to the point of wanting to pay hundreds for something that could roughly last a day on a single charge, needed a massive dock to get power and wouldn't let you change the strap. And I don't see why a watch needs a camera. Ever. So along popped the Gear 2 Neo - shorn of camera, lighter and cheaper than both the Galaxy Gear and Gear 2. It also comes with the new Tizen-based platform, so you've got better battery life and identical performance compared to the original. Everything has been booted into the main face of the watch so the straps can now be changed, and new toys have been added in the shape of a heart rate monitor and an infra-red blaster to control the TV. You will need a compatible Samsung device in order to use the Gear 2 Neo, of which there are currently 18, including the new Galaxy S5. The fitness abilities of the Gear 2 Neo are the 'big thing' for Samsung this time around. The first Gear didn't really have a point beyond just being able to tell you when you've got a message and how many steps you've taken, so now you can go running, hiking or cycling and have your heart rate monitored the whole time. The latter feature is probably the most impressive: taking the same size as before and adding in an optical sensor that shoots light under your skin and sees your pulse. The battery life is improved massively, the Gear 2 Neo can splash around in water and dust thanks to being IP67 rated and comes in a range of nicer colours (orange, brown and black) and is generally a much better device. 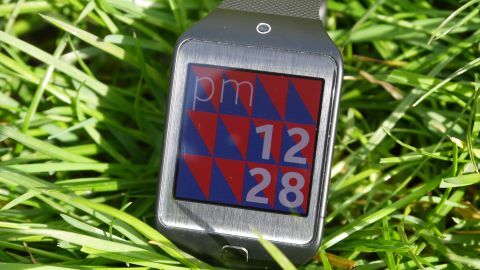 It's also a darn-sight cheaper than the original Galaxy Gear and the Gear 2 as well: the Gear 2 is on shelves for a palatable £180 ($199 or about AU$220) which is a much more attainable figure for the prospective smartwatch buyer. It's still a hefty chunk of cash for something that doesn't do a huge amount more than extending your smartphone screen to your wrist, but as a watch and a wearable it's a decent choice. The Samsung Gear 2 didn't deviate a huge amount from the first iteration, coming in at 36.9 x 58.4x 10.0 mm, and weighing 68g. The Gear 2 Neo clocks in at 37.9 x 58.8 x 10.0mm, but is 20% lighter at 55g, which will make a fairly big difference. That loss of weight is marked. On the wrist it feels a lot less obtrusive than the 'full' Gear 2, and while it's made out of plastic instead of metal, it doesn't feel like that much of a compromise. The look is perhaps a little less premium, but it's nothing too bad and well worth it to have the more comfortable experience. While it's managed to bring in some key specs and improve the design somewhat, the Gear 2 is still a rather expensive smartwatch, coming in at £250 ($295, AU$350). That's close to the cost the original came out for, and it suffered thanks to that price tag. The Gear 2 Neo takes a lot of design heritage from the rest of the Gear range, but now the fact the strap is now a separate piece to the main body of the watch has forced Samsung to refine the design of things, leading to a sleeker device. One of the best bits of the reshaped Gear 2 Neo is the moved home button now on the front of the phone rather than being a small plastic protrusion on the side of the watch. This is important if you've got even a modicum of arm hair, as tapping the button would usually lead to pulling out a few stray follicles, meaning you're left with a Pavlovian hate of using your expensive new watch. With the flush plastic button on the front, with a pleasant amount of travel, the experience is the same as far as the UI goes (long press to turn off or activate outdoor mode) and you can assign many options to the double tap action. This means it's easy to access elements like notifications with the Gear 2 Neo in sleep mode, and is a swift action too. The Sony Smartwatch 2 and the Pebble Steel are both better devices in terms of size, but Samsung's mixture of industrial design and more refined elements (like the IR blaster integration) still brings an element of premium quality to proceedings. The screen, a 1.63-inch OLED affair, is excellent too. It's not great if you're trying to do anything with high res images, such as pictures or similar, but if you've inexplicably made the effort to send pictures over to your watch. The contrast ratio of the OLED screen means if you're doing something like timing your food, checking out how many steps you've taken or just flicking through music, looks really nice and is a pleasant experience on something you've spent so much money on. I prefer the design of the Gear 2 in terms of aesthetics, as it's got a really premium look thanks to the metal. However, if I had to choose between the two devices, the Gear 2 Neo would get my nod simply because it hardly looks ugly in comparison, and loses the weight to make it a more comfortable device. Being able to change the straps will be a real boon to some users, but I quite like the straps that match. Samsung has created a much more refined device in both the Gear 2 and Gear 2 Neo, and as such I think it's inching closer to nailing what the smartwatch should be.